“Habit 1 I am the Programmer. Habit 2 Write the Program. Habit 3 is Personal Management, the exercise of independent will to create a life congruent with your values, goals and mission. Time management is an essential skill for personal management. The essence of time management is to organize and execute around priorities. Methods of time management have developed in these stages: 1) notes and checklists recognizing multiple demands on our time; 2) calendars and appointment books scheduling events and activities; 3) prioritizing, clarifying values integrating our daily planning with goal setting (The downside of this approach is increasing efficiency can reduce the spontaneity and relationships of life. ); 4) managing ourselves rather than managing time focusing in preserving and enhancing relationships and accomplishing results, thus maintaining the P/PC balance (production versus building production capacity). A matrix can be made of the characteristics of activities, classifying them as urgent or not urgent, important or not important. Quadrant I activities are urgent and important called problems or crises. Focusing on Quadrant I results in it getting bigger and bigger until it dominates you. Quadrant III activities are urgent and not important, and often misclassified as Quadrant I.
Quadrant IV is the escape Quadrant activities that are not urgent and not important. Effective people stay out of Quadrants III and IV because they aren’t important. They shrink Quadrant I down to size by spending more time in Quadrant II. Quadrant II activities are important, but not urgent. 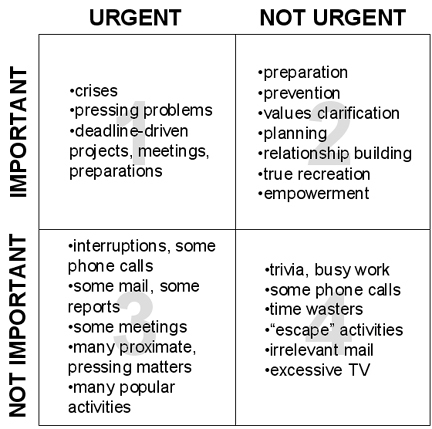 Working on this Quadrant is the heart of personal time management. These are PC activities. Quadrant II activities are high impact activities that when done regularly would make a tremendous difference in your life. (Including implementing the Seven Habits.) Initially, the time for Quadrant II activities must come from Quadrants III and IV. Quadrant I can’t be ignored, but should eventually shrink with attention to Quadrant II. A critical skill for personal management is delegation. Effectively delegating to others is perhaps the single most powerful high-leverage activity there is. Delegation enables you to devote your energies to high-level activities in addition to enabling personal growth for individuals and organizations. There are two types of delegation: Gofer Delegation and Supervision of Efforts (Stewardship). 1. Desired Results Have the person see it, describe it, make a quality statement of what the results will look like and by when they will be accomplished. 2. Guidelines Identify the parameters within which the individual should operate, and what potential “failure paths” might be. Keep the responsibility for results with the person delegated to. 3. Resources Identify the resources available to accomplish the required results. 4. Accountability Set standards of performance to be used in evaluating the results and specific times when reporting and evaluation will take place. 5. Consequences Specify what will happen as a result of the evaluation, including psychic or financial rewards and penalties. The most important ingredient we put into any relationship is not what we say or do, but who we are. The Emotional Bank Account describes how trust is built on a relationship. Positive behaviors are deposits building a reserve. Negative behaviours are withdrawals. A high reserve balance results in higher tolerance for our mistakes and more open communication. 1. Understanding the individual. An individual’s values determine what actions will result in a deposit or a withdrawal for that individual. To build a relationship, you must learn what is important to the other person and make it as important to you as the other person is to you. Understand others deeply as individuals and then treat them in terms of that understanding. 2. Attend to the little things, which are the big things in relationships. 3. Keep commitments. Breaking a promise is a major withdrawal. 4. Clarify expectations. The cause of almost all relationship difficulties is rooted in ambiguous, conflicting expectations around roles and goals. Making an investment of time and effort up front saves time, effort and a major withdrawal later. 5. Show personal integrity. A lack of integrity can undermine almost any effort to create a high trust reserve. Honesty requires conforming our words to reality. Integrity requires conforming reality to our words, keeping promises and fulfilling expectations. The key to the many is the one, especially the one that tests the patience and good humor of the many. How you treat the one reveals how you regard the many, because everyone is ultimately a one. 6. Apologize sincerely when you make a withdrawal. Sincere apologies are deposits, but repeated apologies are interpreted as insincere, resulting in withdrawals. This entry was posted in Priority and time management. Bookmark the permalink.